It's not the bells which have been ringing out in my neck of the woods, this last few days, but the chainsaws! For some reason, our little cluster of neighbours, have gone chainsaw crazy and cut down enough trees to keep those festive log fires burning for months. Yesterday there were actually three chainsaws droning away in unison, in different gardens, and between us, we have made a lot more sky visible. Whole new vistas have been revealed which we were unaware of. Light is flooding into murky corners, where only ivy was brave enough to grow. I reckon we will have two to three more hours of sunshine in our garden every summer's afternoon, due to our lovely neighbours removing three very tall, wide and sombre conifers. All the conifers visible at the right-handside of the photo at the top of this post, have now vanished into thin air ! The photo below shows just what they were concealing from us. Our garden needed some work doing on it, mostly annual maintenance of hedges, pruning and raising of tree canopies, so we called on the ever- affable Richard to come and work some magic. He took off a lot of lower branches on specimen trees to allow more light and air into the garden. 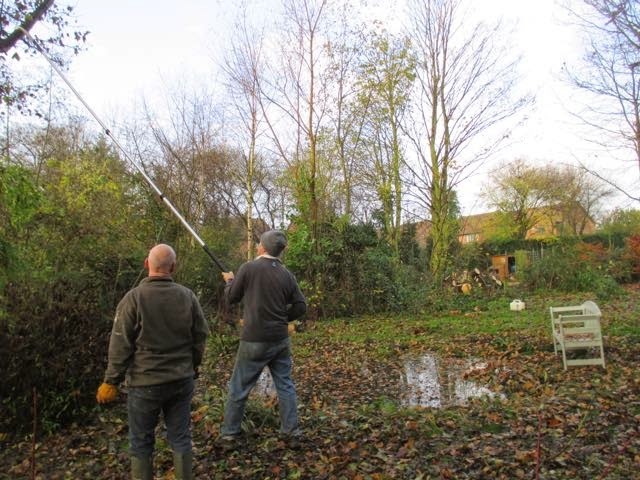 One large sycamore branch was overhanging the wildlife pond, and we were worried that it might puncture the lining, if it fell in as it was sawn through. However, all was well and the offending branch landed on nearby grass with a satisfying thud. 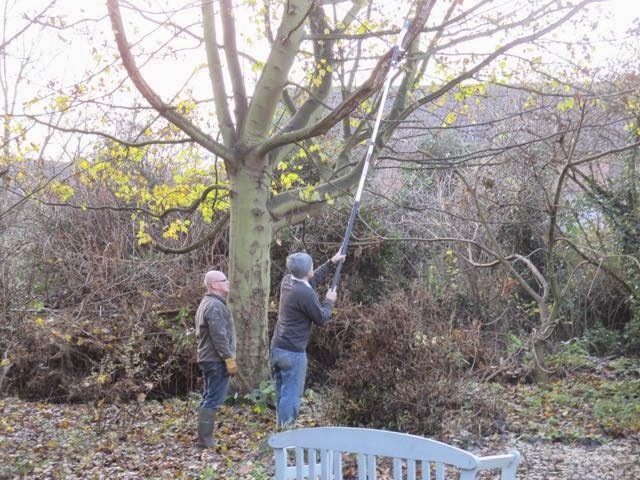 Richard mainly used a manual telescopic saw for the branches, which meant that he did not have to use ladders, or do any climbing. The three tree surgeons who were working next door, yesterday, had a different approach and climbed the trees before the cutting sections above them, with a chainsaw. Half way down the garden is a massive, prostrate conifer which takes up half the garden and is officially the most boring plant on earth. I hate it with a passion and have been giving it the evil eye for years, hoping it would wither and die. It has resolutely ignored me, and remains in the rudest of rude health. And so began a 'discussion' about its future, which has lasted for months between the Under Gardener and myself. I had already donned my black cap, but the Under Gardener begged for a reprieve for the conifer. Guess who won ? Ten minutes work with the chainsaw and I now have a whole new area to plant up ... and I have the roses lined up and ready! 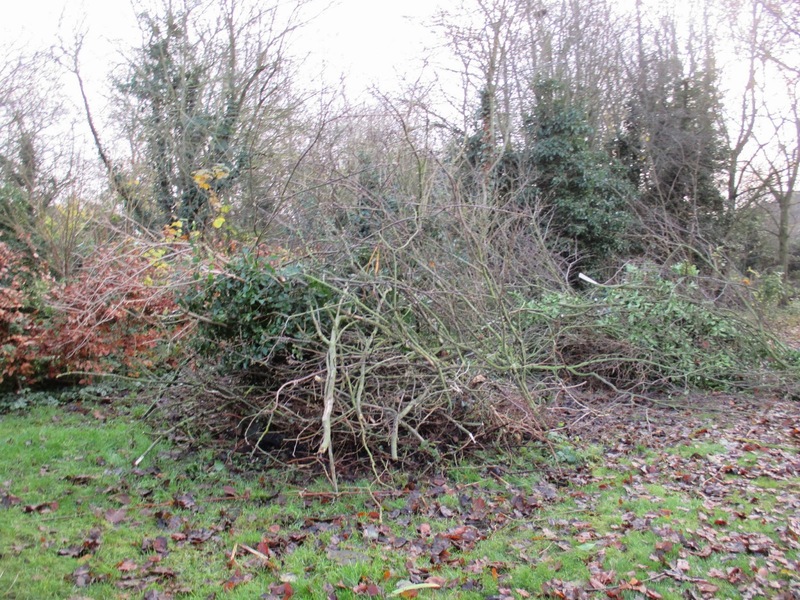 Richard also cut down some complete trees for us, mainly old, self set elders strangled by ivy, and an odd multi - trunked self seeded Robinia which was growing way too large. He did the sawing and we did the labouring, trundling up and down the garden with logged branches and barrows full of brash. There are going to be some cracking bonfires over Christmas and New Year. Now, a whole day of a chainsaw has led to a very full log store, and I feel just like a squirrel must feel when it has a store of nuts for the winter - smug! 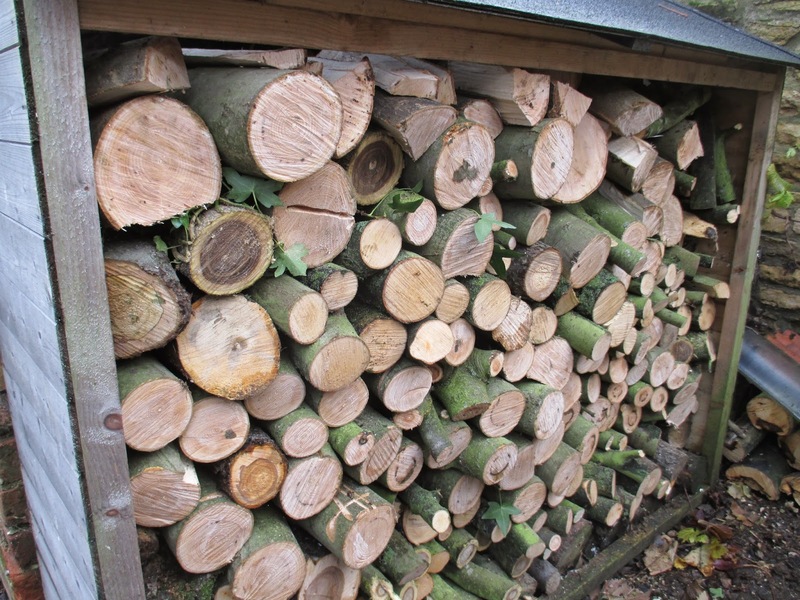 There is no better feeling than looking at a full log store knowing that the wind may blow, the snow may fall, the power may be off - but if you have a full log store you know you can weather it all in a cosy glow. Glad to hear you won the conifer debate Jane, and now you have a new planting area, yay!! 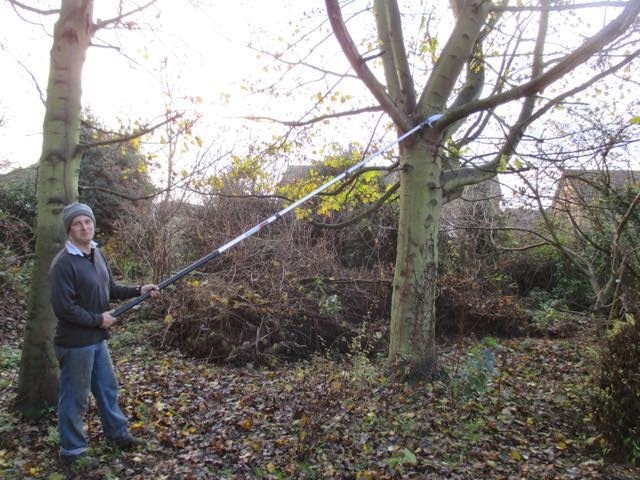 A really good telescopic branch lopper we find a wise investment, we'd never be without ours. And how I wish one or two of our neighbours would go chainsaw crazy too...only on some of their trees of course (especially the burnt ones...). 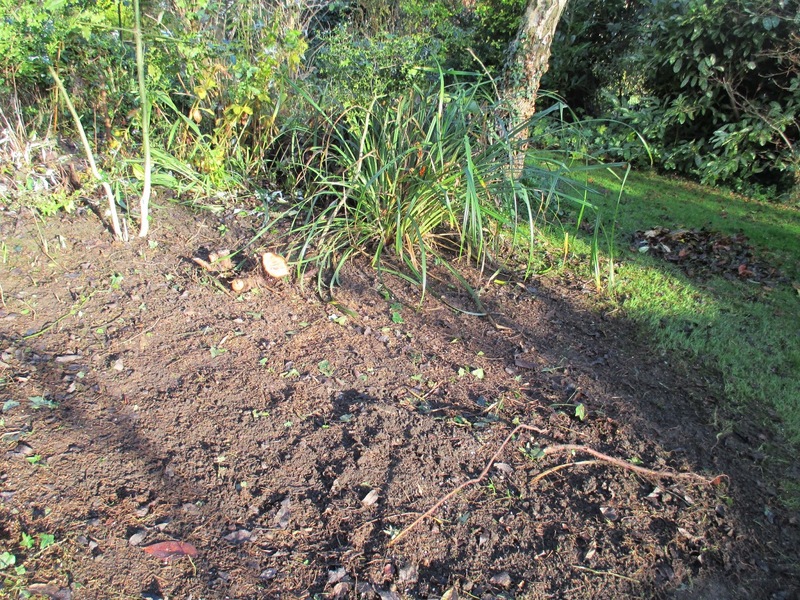 I did feel a bit sorry for the conifer as it lay defeated on the ground, but then I looked at all that bare soil and started to imagine what it will look like in a year or two! Oh, it does make such a difference. On my list for next year. I love trees in their place, but they can grow too big far too quickly, depriving everything else of much needed light. Hi Jessica, trees grow very sneakily in my opinion ! I suddenly notice the self sets in the garden one day, and then realise that they must have been there for ten years or more. How did I not see them before ! If only my under gardener were as pliable. I might have to drop him off for some corrective training. I will be showing him this post with words like view, hours more sunlight etc, heavily underlined. All the while praising your UG as an enlightened and sensible individual, well worth emulating, if you know what's good for you. Training an Under Gardener is a task for life! It took about a year of dropping those key words into conversations regularly for them to have the desired effect. It is a bit like Good Cop/ Bad Cop as I am always the 'Slash and burn' advocate while the UG pleads for them to survive. Hi Christina. I have some lovely old roses to go into that spot. It is south facing and I think they will love it. It was wasted on a boring old conifer! Sometimes it's just time to prune and clear. I'm always a little sad to see a healthy tree go, but it can help the entire ecosystem if everything is too crowded. It does change the garden's personality and planting options, though, doesn't it? My garden has gone more shady over time, so I wouldn't be sad to see a little more sun. I know what you mean about the sadness of seeing a good healthy tree go, and although I have felt it keenly in the past, these were easy decisions as most of them were old and rotten - old elders so strangled by ivy that it held them upright even when they should have been horizontal ! Good for you! I love trees but they do block a lot of sunlight! It is amazing how it has altered the quality of the light even at this time of the year. It feels like a new garden! Enjoy your Yule logs and bonfires - you deserve it, Jane :) I actually enjoy pruning in many cases, but I have some strange feelings of primeval guilt over having trees taken down or even doing heavy pruning on them - no idea why... Not that it matters here, where there is nothing whatsoever larger than the little orange tree - and I've already taken the loppers to that with satisfactory results!! Hi Anna, I am pleased to report that everything was cut down through choice not necessity this time round ! I love trees, but sometimes we have to correct the garden when they are growing too big. 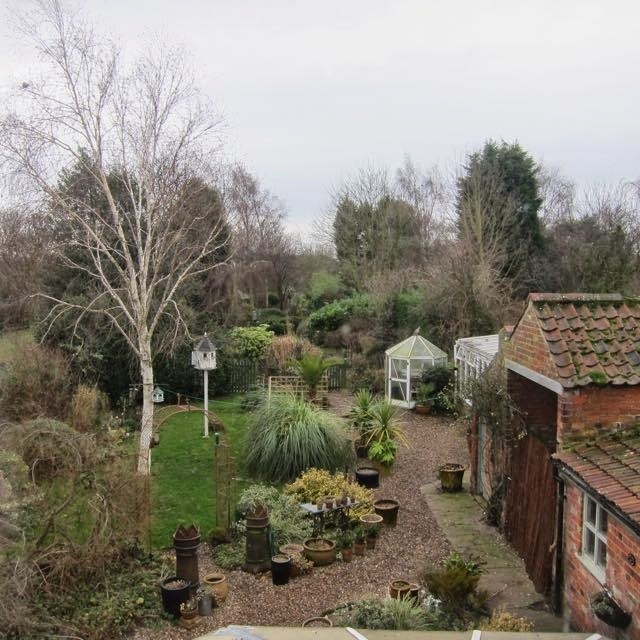 So nice you have got a lot of new space to carry out new ideas and the light in the garden, so important I think. Last month we have cut down and dug up 4 conifers, I was delighted for I have new ideas for the garden, on the other side I was so sad, these 4 conifers I had grown from seed of a holiday in Italy 35 years ago. But by the time the garden changes and people change too, I am getting older and a little less work is welcome. Hi Janneke, that must have been a hard decision to make, when the conifers had an emotional connection. I have found this part of gardening one of the hardest to learn. When the garden is new it is all about growth and nurturing, then one day you look around and realise that it has to be a balance between growth and cutting down/back. That balance is a difficult one to get right, and sometimes means tough decisions. The site of mass treeicide? We have reduced the canopies of a couple of trees this year and hope there will be more light on some borders next summer. Sad but necessary. Hi Sue, sad but necessary is right ! Some of my border inhabitants were having to lean at a crazy angle to get the light they craved. I had to listen to them, and I swear they said 'thank you' when those big shading branches came down! Well done Jane. I have a small garden of 10 by 10 meters. Behind my little garden the town planted hazelnuts and wild cherry tree's. My garden is facing south-west but because of the high tree's after 3 pm there is no sun in my garden anymore. The town promissed to do something about it next year. That will bring a lot of light in my garden. Succes planning new things for your new sunny and light spots now. Hi Maijke, I bet you can't wait for those trees to be taken down so you get the sunlight back ! Looks like you've been very busy. 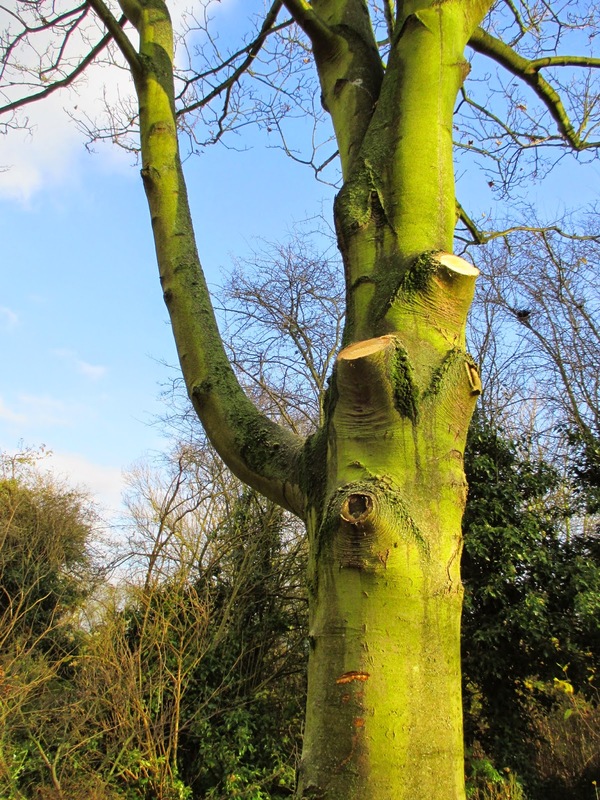 It's a tough choice to cut down trees as they take so long to grow but the sunshine will be awfully nice in the garden. I love trees as a backdrop, at a distance where they don't affect the lighting as much. Have fun planting up! Hi Marguerite, I agree - trees are much better at a distance! I do love them but they need close watching otherwise they turn into huge monsters seemingly overnight! You have do a good job. Cut the tree or sometime just do pruning are something that so hard to be done, especially when that plant look grow so well. Pruning and trimming sometime make my heart breaking. Hi Endah, it can be heartbreaking, but sometimes we just have to be cruel to be kind! 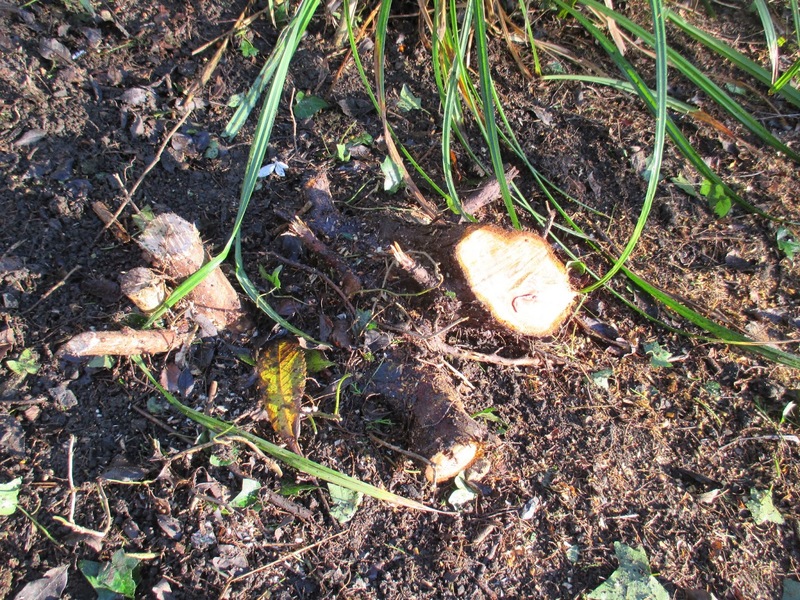 There is nothing as satisfying as a bit of forestry in the garden. 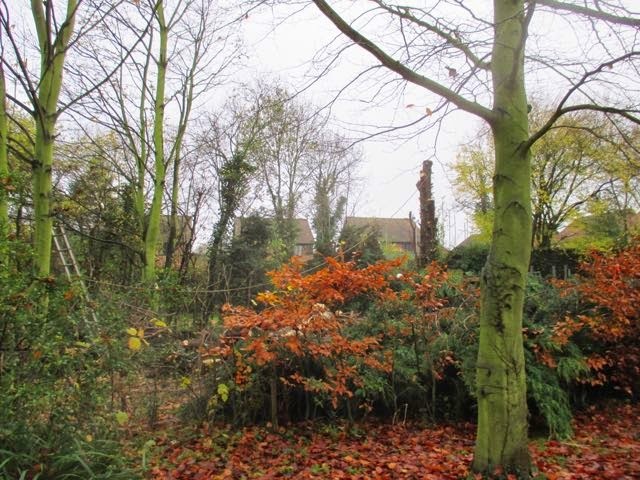 Getting rid of unwanted trees or improving the appearance of existing ones, bringing light to the garden. It is like getting a new garden with different perspectives and room for planting more exciting things. Well done! And you get all those logs too. I think you are going to be needing them soon. It is definitely getting colder. Hi Chloris, it s very cathartic! The light is totally different even at this time of year. It is definitely getting colder - we have had the hardest frost so far this morning so a big log fire is called for ! Hi Rick, same here! I have been planning this chainsaw madness for months! Wonderful post, Jane. Thank you so much for sharing. There are contradictions in the posts on different blogs; some people bewailing the loss of trees and others welcoming new space and new light. I envy you your bonfires and indoor logs. Hope you have a very happy and interesting 2015. Hi Lucy, it depends so much on individual circumstance ! 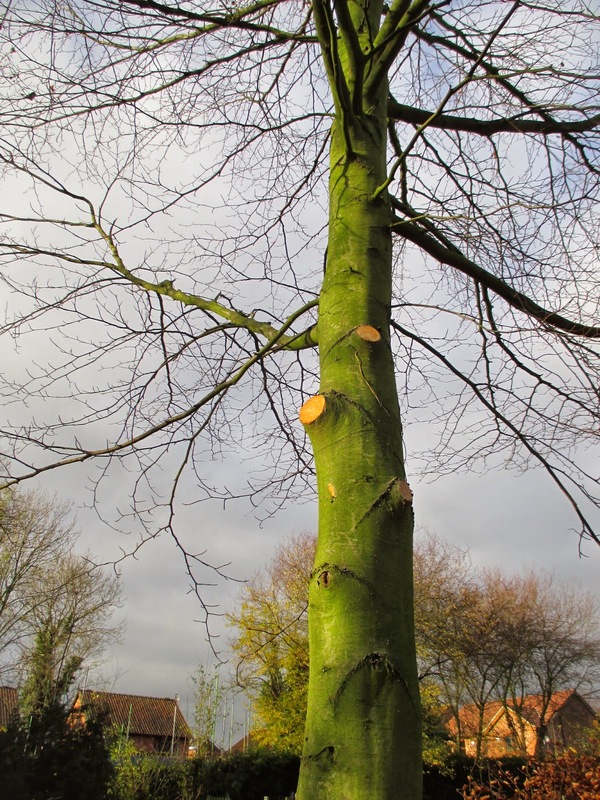 I am delighted to see some trees go, but others are very precious ! We have a tamarisk and I think the world would end if anything happened to that! Thank's for post sharing. My favorite feature of this chainsaw is the automatic oiler system and a tool-less chain tensioning system for quick and fast chain adjustments. Pole Saw are efficiency and versatility; the pole and saw can be detached and you can use the chainsaw on its own whenever you like. For some cutting edge families, Christmas is otherworldly, magnificent furthermore loaded with anxiety. There are such a variety of a minute ago things to do, conventions to maintain, desires to be met and relatives to pacify. In any case, how would you minimize the crunch and weights without relinquishing occasion delights? Here are ten tips to help you arrive. I am using this makita electric chainsaw it is really good. find electric chainsaw bestechub from here.